I figured that since Tequila is rumored to make your clothes fall off, it would also take shrimp shells off! Dangit it didn’t work but I ended up with some tasty drunken grilled shrimp. 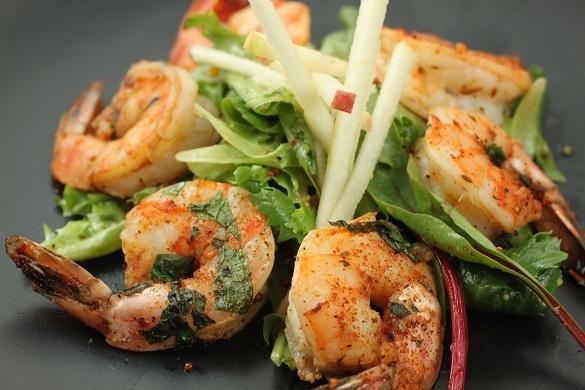 Grilled shrimp is a great addition when you are in the mood for a healthy salad. For a crowd pleasing appetizer version, use more shrimp and fewer greens. You can also flambé the shrimp in a sauté pan in front of your guests and dazzle them with your showmanship. I found tangerines in season at my local farmers market but you can use any citrus such as orange, lemon, or lime in the dressing. A bit of mint lends a hint of freshness that reminds one of lazy summer days. The Fuji apple sticks create a sweet crisp bite. Peel and devein shrimp. Evenly dust with SYD Hot Rub and two tablespoons of freshly chopped mint. Drizzle canola oil over shrimp. Put into a re-sealable plastic bag, add 2 tablespoons (or more) of your favorite Tequila squish the bag and set aside to marinate for about 20 minutes. Don’t marinade for more than 60 minutes as the Tequila can denature the protein in the shrimp (i.e., cook the shrimp). Whisk the Tangerine dressing ingredients together in a bowl and store in the fridge. The dressing will last a week in the fridge. Make sure you taste the dressing and adjust the amount of citrus to your liking. If it is too tart, add some white sugar to balance out the flavor. Heat up your grill to 450°F or perform the hand test. The test is a measure of how long you can hold your hand 6 inches above the grill before withdrawing your hand. 2-3 seconds is equivalent to about 450°F. Ensure that your grates are cleaned and oiled before cooking to reduce sticking. Cook shrimp on hot grill, about 2 minutes on each side depending on size of shrimp. If you’re not using a grill, you can use a hot sauté pan. I like to cook until the shrimp begins to turn opaque (there are no translucent parts) and remove from heat. This will allow the residual heat from the next step to perfectly cook shrimp. Prepare to flambe the shrimp as follows: Heat an oiled saute pan until very hot. Add the shrimp you took off the grill to the hot saute pan. Tilt pan away from you and carefully add 2 tablespoons (or more if you like) of your favorite Tequila. The alcohol will flambe and burn out leaving the flavor behind. Coat greens with dressing. Separately, coat shrimp with dressing. 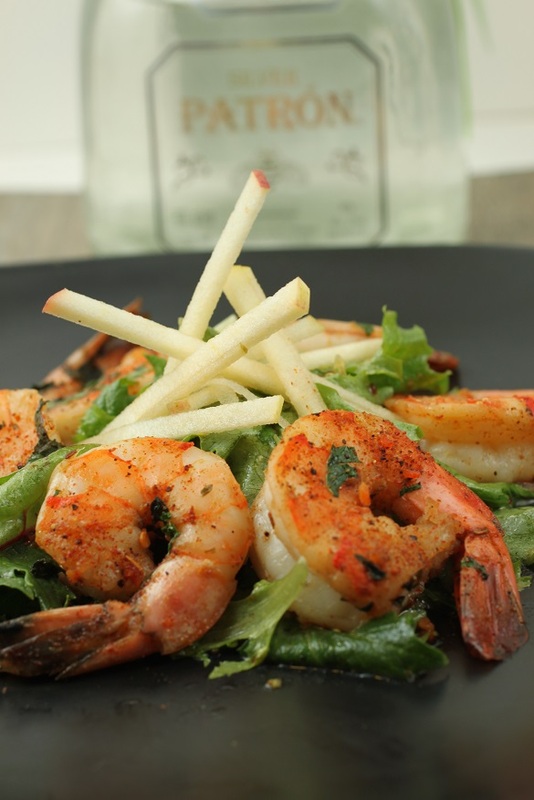 Mount the dressed salad on a plate and arrange the grilled shrimp around the side. Garnish with Fuji apple cut into matchstick for a contrasting crunch.